The Digirout 1000 Nema Control box provides reliable motion control of the digital motors. The picture above shows the kit. A standard 16 gaugesteel welded box is punched for the db25 parallel port input, compenent mounting, and fan inlet & exhaust holes. 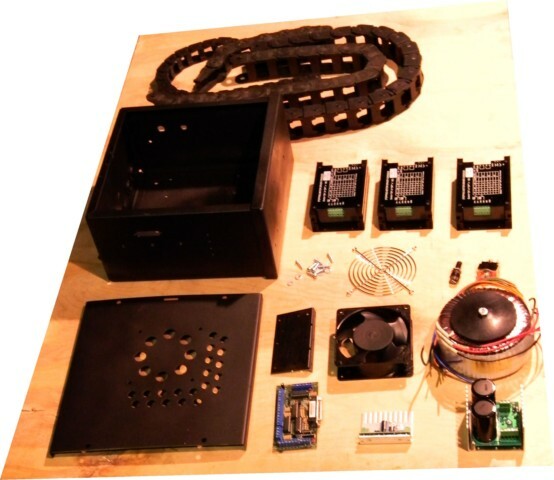 The component kit comprises 3 5a 60vdc microstpping drives, 500 va toroidal transformer, DC bridge rectifier and capacitor, 5v powers supply, breakout board with signal amplifiers and mounting plate, and high cfm AC fan & guard. .